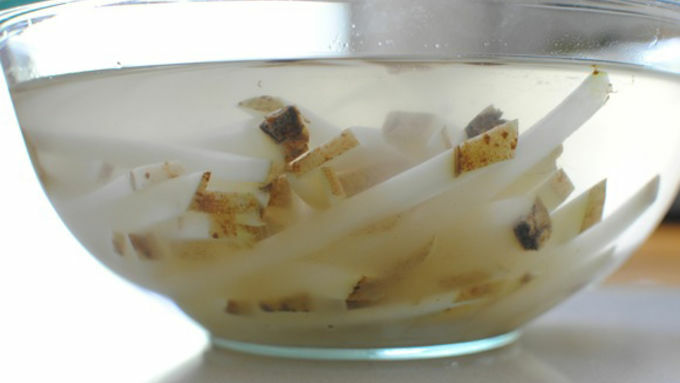 Place the thinly sliced potatoes in a large bowl of cold water. Let sit for two hours. After 2 hours, rinse the potatoes a few more times to get most of the starches out. Pat them dry really well. Dry out the bowl, and toss the fries back into it. Toss with the olive oil and a good pinch of salt and pepper. 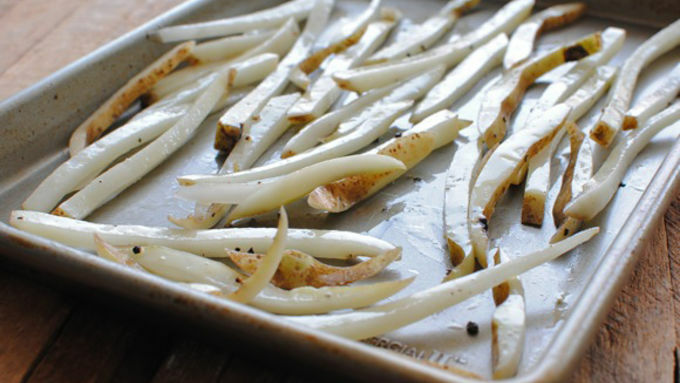 Arrange on a baking sheet and slide into a 475°F oven. Bake for 15 minutes. Flip them and bake another 15 minutes. Based on your oven you might need a little more time. Remove from oven and place on a paper towel-lined plate. 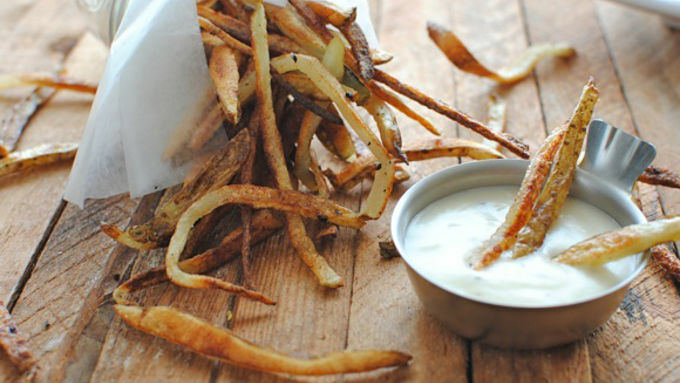 Lightly dash the fries with the truffle oil, and another good pinch of salt. For the sauce, melt the butter in a small saucepan. Add the flour and whisk for a good minute, until well combined and that flour taste is gone. Slowly add in the cream and wine; whisk until combined. Simmer and reduce the sauce for about 5 minutes. Add in the parmesan cheese and a good pinch of salt and pepper. Continue to simmer another 5 minutes. Taste. Add a little more salt if needed. 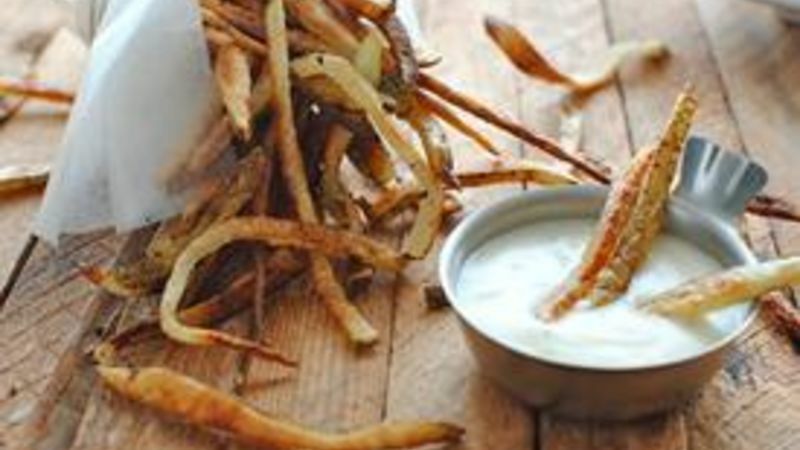 Serve truffle fries with chardonnay dipping sauce. Bonjouuuuur, mon amieee! Comment allez-vous, ce soir? Moi? Je vais bien, merci! You guys, I barely had to look any of that up and I'm so not joking right now. I was like, really really good in French class. All 6 years of it. I'm JOKING! 5 years. 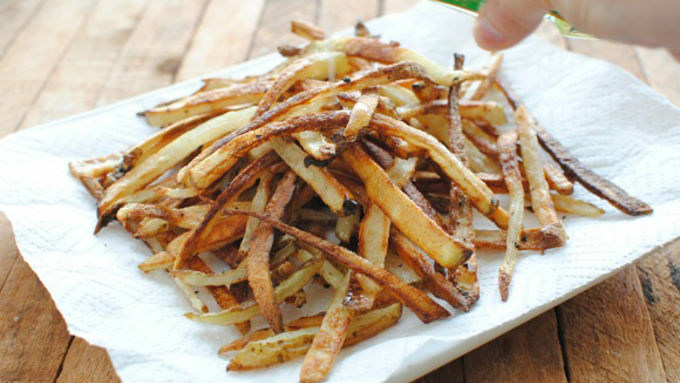 So yes, Bastille Day is like 20 minutes from now, so it's time to get out your black and white striped shirts, berets, cigarettes (not really, mom), and get your truffle on with these here truffle fries and a WINE dipping sauce. Wine. Dipping. Sauce. I mean I know. Now, I don't own a truffle farm in my back yard like I used to, but I'll tell you what, a couple of drizzles from the bottle will work some dang magic on some dang French fries. ET, ET, ET (that's French for "and"), when you whisk together some dry Chardonnay wine with heavy cream, flour, butter and parmesan cheese? Ummmm, OUI. Allons-y! I got your Bastille Day RIGHT HERE. Au revoir! A feast of fries in all shapes, sizes, and styles. Give them all a try!